The DRM-084 series of rugged rack mount LCD monitors are designed specifically for COTS Military and Marine Display applications. 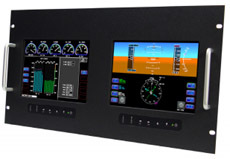 Occupying only 4 rack units of a standard EIA RS310 C – 19” equipment rack, yet having two high resolution 8.4” LCD screens with completely independent OSD controls and video inputs. The DRM-084 provides image reproduction that exceeds all other displays available in a similar form factor. The DRM-084 is capable of operating with legacy signal timings such as RS-170 (525 Line) and RS-343 (875-Line) Interlace formats. Also, NTSC/PAL Video (RCA Jack), S-Video (5 Pin Mini Din) and VGA (HD15-DSub) Standard VESA Input Timings. If you need COTS Sealed Monitors, Rugged Marine Monitors, or just have a general-purpose need for rugged computer monitors, the DRM-084 series of COTS LCD Monitors is an excellent solution for your rugged display requirements. Legacy Timing: 15KHz to 100KHz @ 55 to 85Hz. Legacy Products 15 to 100KHz Horizontal Freq. External Connectors Analog HD15 D-Sub Input; 5 BNC, DC or AC Input. Humidity 5 to 90% RH @ 40°C Non-Condensing. Cold Start-Up Start-up @ 0°C 10min usable picture. 20 min. full spec.